Create a selection menu of arbitrary options. 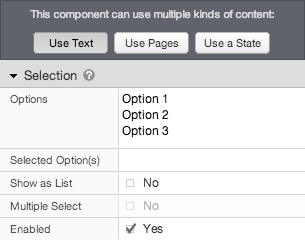 A text-based selection creates a pop-up menu, single- or multiple-select list, which you can use as part of a form. You configure the component by specifying the list of options, the default selections, the type of control, and whether the control is enabled. Options The list of option names, each on its own line. Selected Options The list of options that are selected by default. Separate multiple options with commas. The list should contain the options’ numbers, rather than their names. For example, to select “Option 1” and “Option 2” in the screen shot above, use “1, 2”. Show as List Whether to show the selection as a list box, rather than a pop-up menu. Multiple Select * Whether to allow multiple options to be selected. Enabled Whether the selection is enabled. A disabled selection cannot be clicked. * This setting is only available when Show as List is selected.